The mining community, a rough set of people, quickly increased, and resisted the imposition of a tax; a military force was sent to coerce them, and the fight of Dec. 3, 1854, in which many were killed and wounded, took place at the “Eureka stockade,” upon a site now occupied by the streets of the town in Ballarat East. There are above six thousand miners now employed; deep shafts have been sunk, powerful steam-engines, puddling machines, sluices, pumps, and stamping-mills, have been applied to the work, and quartz-crushing goes on to the amount of a quarter of a million tons in a twelvemonth, producing about eightysix thousand ounces of gold. Where the root of all evil is so abundantly produced, it is satisfactory to be informed that ample provision is made for religious instruction and worship. There are forty churches and chapels in the town, belonging to different ecclesiastical communities; and the Episcopalian Church of England fairly holds its own among them, presided over, since 1874, by the Right Rev. S. Thornton, Bishop of Ballarat. The pro-cathedral, known as Christ Church, is no longer regarded as capable of accommodating the large congregation attracted to its services; and it was therefore resolved by the Church Assembly, in March last year, to built a permanent cathedral on the same site, at a cost of £35,000, exclusive of the intended tower and spire. A Board was appointed, representing the whole diocese as well as the parish of Christchurch; the Bishop, Archdeacon Allnutt, and Archdeacon Julius, being chairmen of its finance and building committees; Mr. E. J. Webb, treasurer; and the Rev. H. C. E. Morris, secretary. The design of the proposed building is shown in our Illustration; the architects are Messrs. Tappin, Gilbert, and Dennehy, of Melbourne and Ballarat. There will be an entrance corridor with porches, a lofty mave with aisles, three transepts, and the choir with apsidal chancel; also a baptistery and vestries. The building of the nave, for which £15,000 is required, will be first begun, and the remainder will be undertaken in sections, as the additional funds are subscribed. It will be used for the parish church as well as for the Cathedral, with an arrangement of services for each separate congregation at different hours. We hope the Bishop's appeal will be met by public liberality worthy of the Goldfield City of Ballarat. 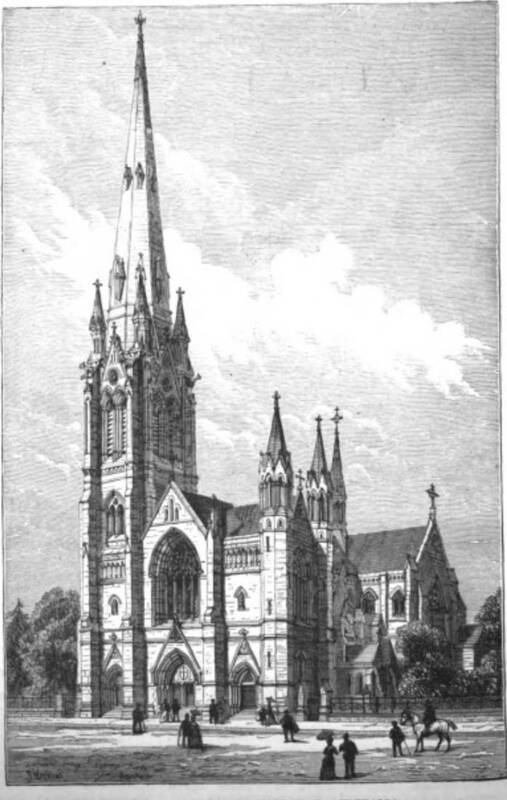 “The [Planned] Cathedral of Ballarat, Australia.” Illustrated London News. (26 February 1887): 224. Hathi Trust Digital Library version of a copy in the University of Chicago Library. Web.